In 1737 to 1776 San Miguel had many unique Christmas traditions. Posadas were introduced by the Franciscans in San Miguel Viejo featuring images of Mary and Joseph that traveled to nine homes of wealthy Spanish nine days leading up to Christmas. The ultimate day, statues were replaced by people and this theater of Jesus’ birth is still performed in the luminary lit streets of La Cieneguita, Cruz del Palmar, La Cuadrilla and Rancho Viejo. When ended, the posada’s children received paper baskets filled with sweets donated by local nuns and members of the Confederation of the House of Loreto. The “Misas de Aguinaldo”, or “Masses of the Christmas Box” started early Christmas morning at 3 AM in the Parroquia. Then at 4 in the Holy House of Lareto in the Oratorio, at 5 in the Temple of the Immaculate Conception (Las Monjas) and then at 6 in the Santa Ana. Songs sung were typical Christmas songs that are now sung in the posadas. 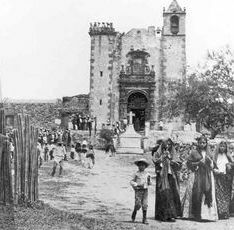 Masses terminated with the distribution of “los aguinaldos”, small bags of candy, with hot drinks of punch and atole, still common today in the cold months. In the afternoons people returned to their local churches to sing many locally written Christmas carols with choirs and orchestras. Children were given tambourines and whistles to join in the songs and prayers. The most popular choir for both morning and afternoon services was from the College of Santa Ana as they were the most selective group of singers in San Miguel.